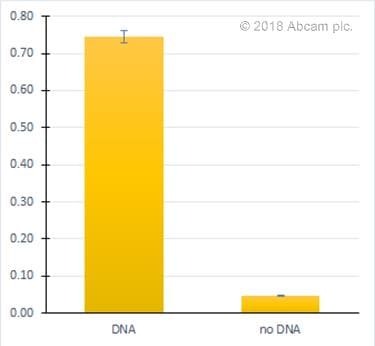 ab156917 DNA high Binding solution provides a highly efficient method for binding DNA on the microplate surface. This product allows the DNA to be tightly bound to the microplate surface in a quick manner without need of overnight incubations or heating microplates. 1. Add 100 μl of DNA high binding solution into the microplate wells and 1-8 μl of DNA solution (0.1-200 ng) for coating. 2. Incubate for 2 hours at 37°C. 3. Remove the solution from the wells and wash with PBS-T 2 times. 4. Dry at room temperature for 10-20 min. The plate can now be immediately used or stored at 4°C for up to 6 months. Our Abpromise guarantee covers the use of ab156917 in the following tested applications. ab156917 has not yet been referenced specifically in any publications. Publishing research using ab156917? Please let us know so that we can cite the reference in this datasheet. DNA Binding microplate solution used in an ELISA with DNA isolated from HEK cells. Image shows graph of dsDNA reading with and without DNA added. (incubated with TMB read at 605nM). Can you bind RNA on microplate using this product? It can be used for RNA binding as well. Can you bind single nucleotides to the microplate using this solution? I can confirm that the DNA binding microplate solution, ab156917, can be used to bind single nucleotides. Basically any DNA fragment less than 100 bp will bind including single nucleotides.